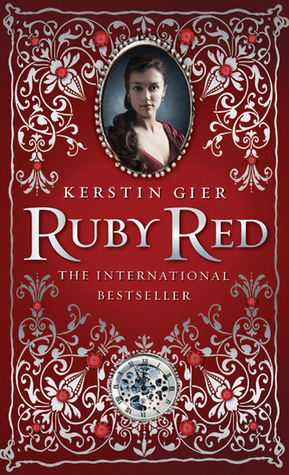 If I had to choose just a quick phrase to describe Ruby Red, I'd definitely go with utterly enchanting. Even if I hadn't received this book for review I would have likely bought it just based on the cover. (I admit it, yes.) The deep red, the gorgeously raised silver accents, it is too beautiful for words. Then I flipped the book over and read the synopsis that cemented my attachment to this book. I cannot express enough how much I was in love with this book before I even opened it to the first page. Of course, then I did open it, at which point I was swept away into a brand new world. Gwyneth Shepard is an amazing character. I loved her tenacity and her quick wit. The banter between her and the infuriating (albeit rather handsome) Gideon de Villiers is fantastic. I appreciated the fact that Kerstin Geir allowed her character to be so human and flawed. Gwyneth wasn't raised to be a time traveler, she isn't the "pretty" sister, and people are doubting her at every turn based on a past she can't remember. At the heart of it all, she's just a normal girl who can do extraordinary things. Coping with that isn't easy for her but, despite some slight negativity, she vows to do the best that she knows how. I loved her for that. If the characters themselves weren't enough though, the expertly woven story really brought it home for me. The time periods that Gwyneth and Gideon travel to are richly detailed, and accurate. The story behind the beginnings of these time travelers is well fleshed out, and it leaves just enough to the imagination to keep you wanting to read on to the next in the series. It was nice that, despite the numerous characters across time periods, there was always something to help me realign myself with the overall story. Add in a bit of intrigue, deception, and an ending that had my mouth hanging open, and you have a book that I fell so deeply in love with that I'm likely going to read it again. 2012 cannot come soon enough I tell you. I need to know what happens next! So yes, I loved this book with all my heart. 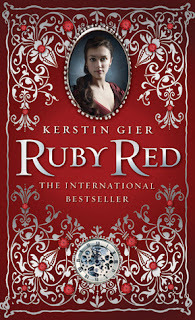 Ruby Red is a beautifully executed mix of historical fiction and science fiction that is sure to delight. To all my readers who enjoy books of this nature, you need to pick this up. The story that Kerstin Gier has woven for us is not to be missed!